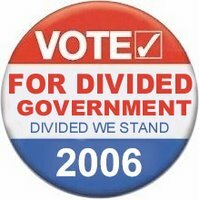 The Dividist Papers: More scholarship & more reasons to vote for divided government. More scholarship & more reasons to vote for divided government. While googling for divided government fodder to include in the weekly carnival, I ran across a blog post by Tung Yin speculating about a New Voting Heuristic, and referencing a Harvard Law Review article entitled Separation of Parties not Powers by Daryl J. Levinson and Richard H. Pildes. The work is a tough slog through citations, footnotes, and legal arguments, but is worth the effort. 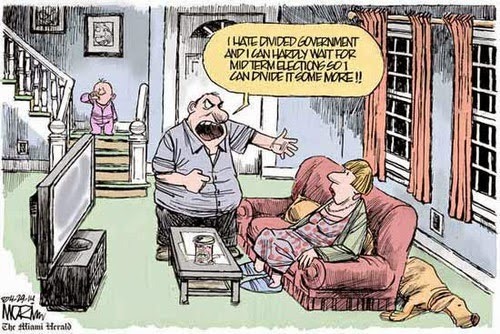 The payoff is some original thinking on the benefits of and historical basis for divided government, and yet another reason to vote divided. With this additional reason added, we present a brief 5 point summary of the reasons to vote for divided government and the scholarship that supports it. Selections from Separation of Parties not Powers by Levinson & Pildes (which has been added to the permanent DWSUWF scholarship links in the right sidebar). "American political institutions were founded upon the Madisonian assumption of vigorous, self-sustaining political competition between the legislative and executive branches. Congress and the President would check and balance each other; officeholders would defend the distinct interests of their different institutions; ambition would counteract ambition. That is not how American democracy turned out. Instead, political competition and cooperation along relatively stable lines of policy and ideological disagreement quickly came to be channeled not through the branches of government, but rather through an institution the Framers could imagine only dimly but nonetheless despised: political parties. Few aspects of the founding generation’s political theory are now more clearly anachronistic than their vision of legislative-executive separation of powers. Yet few of the Framers’ ideas continue to be taken as literally or sanctified as deeply by courts and constitutional scholars as the passages about interbranch relations in Madison’s Federalist 51. This Article reenvisions the law and theory of separation of powers by viewing it through the lens of party competition. In particular, it points out that during periods — like the present — of cohesive and polarized political parties, the degree and kind of competition between the legislative and executive branches will vary significantly and may all but disappear, depending on whether party control of the House, Senate, and Presidency is divided or unified. 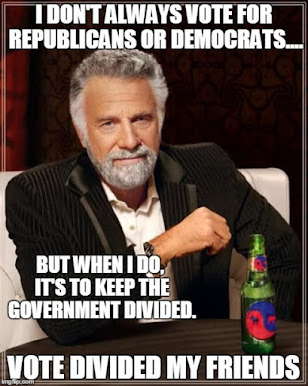 The practical distinction between party-divided and party-unified government thus rivals, and often dominates, the constitutional distinction between the branches in predicting and explaining interbranch political dynamics." "We should recognize that this picture of gridlocked divided governments versus steamrolling unified ones is something of a caricature. As discussed above, during periods of ideologically heterogeneous parties, relatively stable cross-partisan coalitions have constituted a government majority along certain policy dimensions. And even when the parties are ideologically cohesive, the specific constituency interests of individual MCs are sufficiently fragmented, and MCs sufficiently independent, that Presidents can sometimes cobble together issue specific majority coalitions across party lines. Supermajority requirements in the lawmaking process (including veto overrides and Senate filibuster cloture votes) often necessitate some degree of bipartisanship even when government is unified. And of course the parties will sometimes find that the imperatives of events or public demands for government action make compromise across divided government the winning play. These factors all tend to dampen the productivity differences between divided and unified governments. We should not be too surprised, then, that divided governments have sometimes accomplished a great deal... more surprising is Professor David Mayhew’s well-known study of the legislative record from World War II through 1990, finding that divided governments enacted about the same volume of “significant” legislation as unified ones. But it hardly follows from Professor Mayhew’s findings that the distinction has been without a difference. Professor Mayhew does not assess the content of legislation. Perhaps politicians in Washington usually prefer to do something about the salient issues of the day rather than suffer the political consequences of perceived partisan gridlock, but what unified governments accomplish may be considerably more ideologically ambitious and extreme." "It is futile to argue that political parties do not influence relations between the legislative and executive branches. Clearly, political alliances, both formal and informal, matter. The greater the political cohesion, the less critical separation of powers becomes, and conversely, the more divided the government, the more political structures matter. But parties do not operate outside the framework of Constitutional structures, and these play important roles in determining the fate of legislation, treaties, nominations and Congressional hearings." At the risk of oversimplifying this interesting dialog, Levinson and Pildes make the case that (in the world of real world politics) unified and disciplined political control of both the legislative and executive branch renders constitutional separation of powers moot. Epstein says in rejoinder, that the constitutional structural separation of powers remains relevant and important, even if undermined by unified single party control. He also thinks they worked way too hard to make a simple point. But all agree on the deleterious effects of single party control. One more reason to vote smart by voting divided. Technorati tags: divided government, congress, libertarian, 2006 election,democrat,republican,constitution.